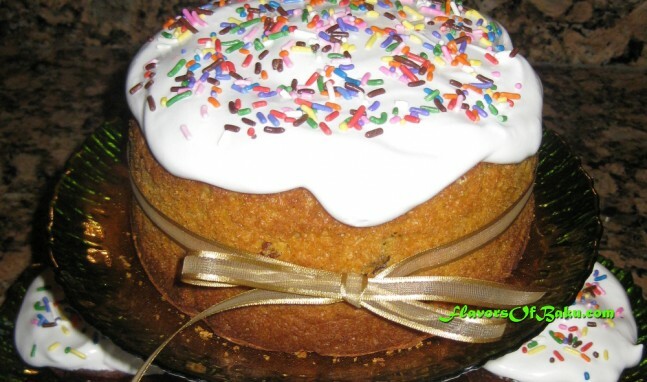 Kulich is an Easter cake. 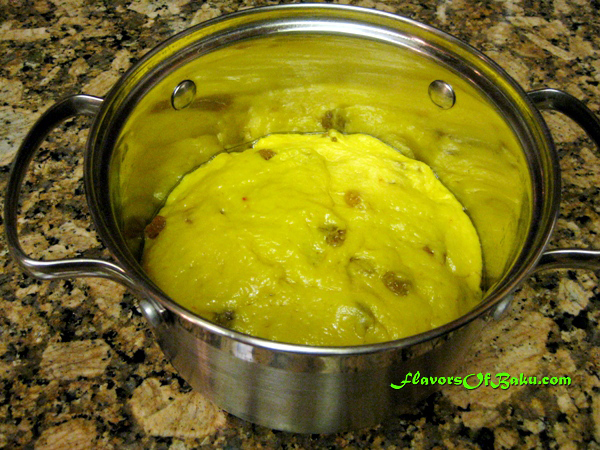 It is similar to Panettone and is served only on Easter. 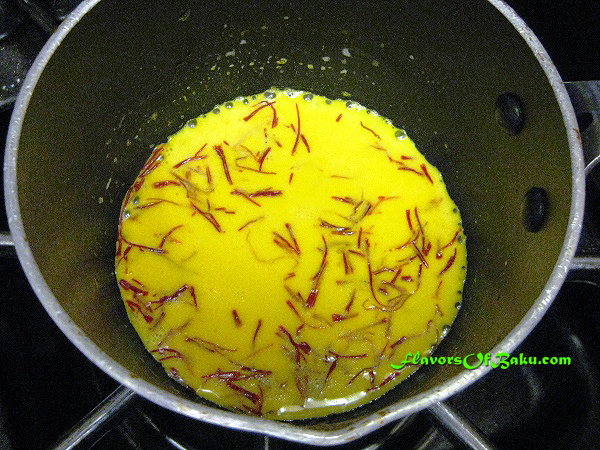 Place saffron threads in a small saucepan, add 2 tablespoons of hot milk, and leave it to brew. 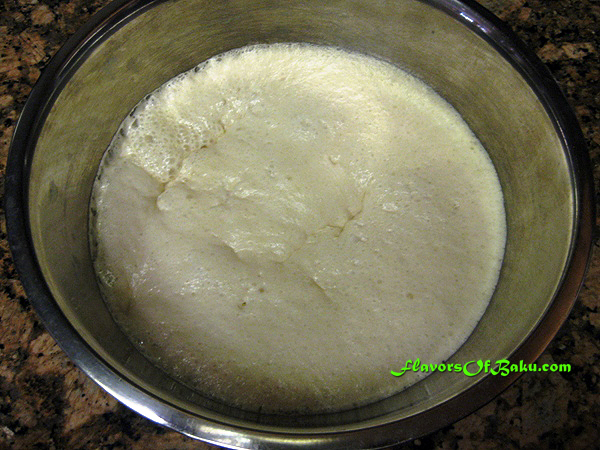 Prepare the yeast mixture for the dough. Mix in a bowl: 1 package of yeast, 2 tbsp flour, 1 tbsp of sugar, and 1/3 tsp salt. Add ½ cup of lukewarm cream, mix well, and allow it to rise in a warm place for 1 hour. 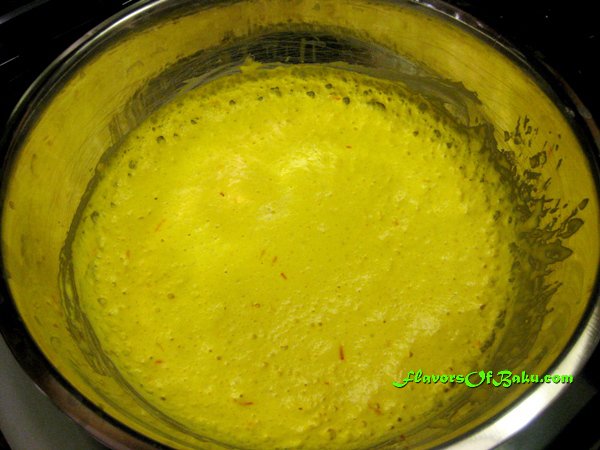 In a separate bowl, pour ½ cup of warm milk and saffron-milk infusion. Add 1 cup of sifted flour and whisk until the batter is smooth. Then, add the yeast mixture, mix well, cover the bowl with plastic wrap, and put the dough in a warm place to rise until it doubles in size. Once the dough rises, it will start to sag and bubble. In a separate bowl, whisk the egg and egg yolks with a cup of sugar and the vanilla sugar. 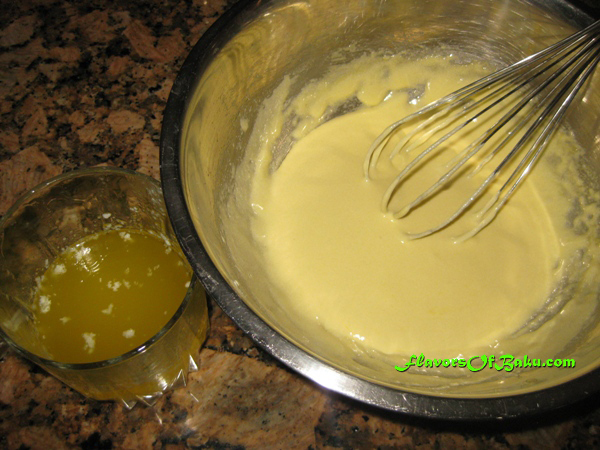 Whisk until the mixture lightens, then add ½ cup of warm, melted butter and whisk the mixture into the batter. 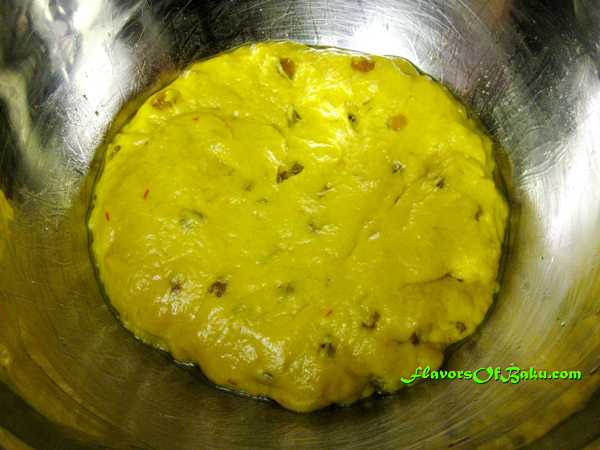 Pour the egg-butter mixture into the dough bowl and stir, then gradually begin adding the sifted flour while kneading the dough. The dough should be very soft and tender. 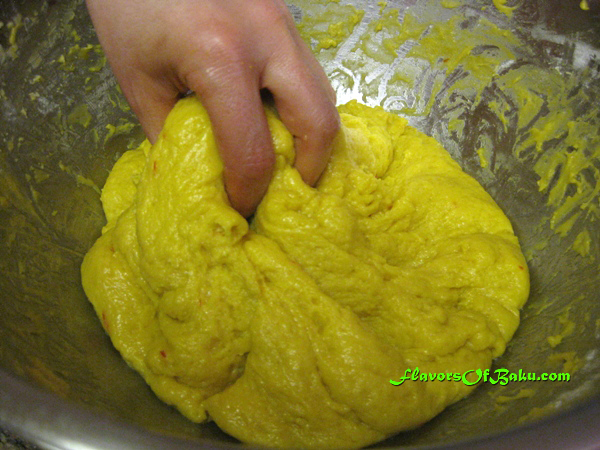 Continue kneading it until it is smooth and does not stick to your hands. 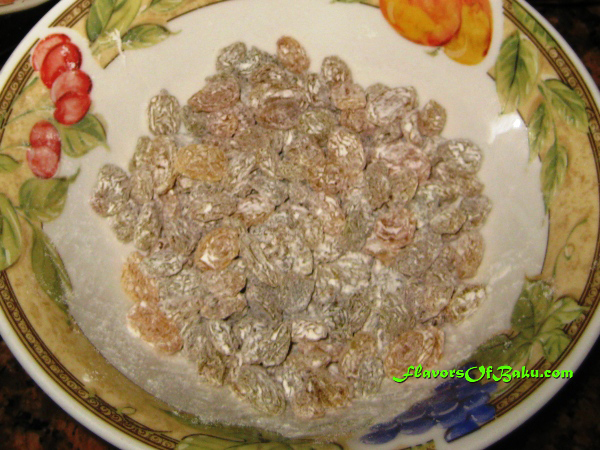 Toss raisins with a tablespoon of flour. Then add them to the dough and knead until they are distributed evenly. Form the dough into a ball and place it into a large bowl. Cover the bowl with plastic wrap and leave in a warm place to rise for about 4 hours. After the dough rises and becomes puffy, knead it a few times and divide it into pieces. Form each piece of dough into a ball and place into your baking molds, filling them on 1/3. If you’d like, you can use a small pot instead of molds. Cover them and leave in a warm place to rise to the top of the molds. 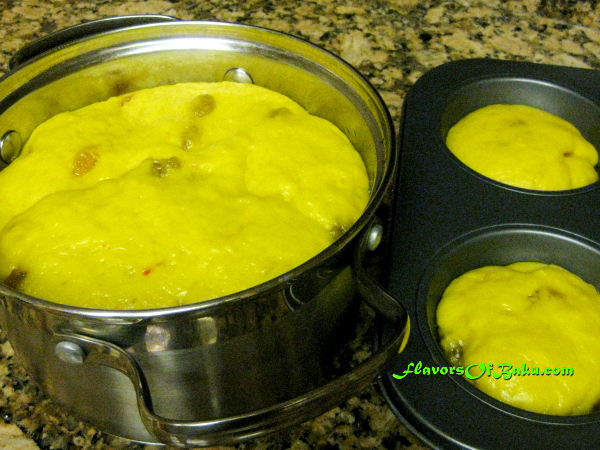 Pre-heat your oven to 350°F (180°C), and allow the kulich to bake until it rises and is lightly browned. For the first 20 minutes, do not open your oven at all, otherwise the kulich will fall. Then, periodically check your kulich for readiness by gently sticking a toothpick into it. If the toothpick comes out clean and dry, then the kulich is done baking. Let the kulich cool for about 15 minutes before gently removing it from the mold. 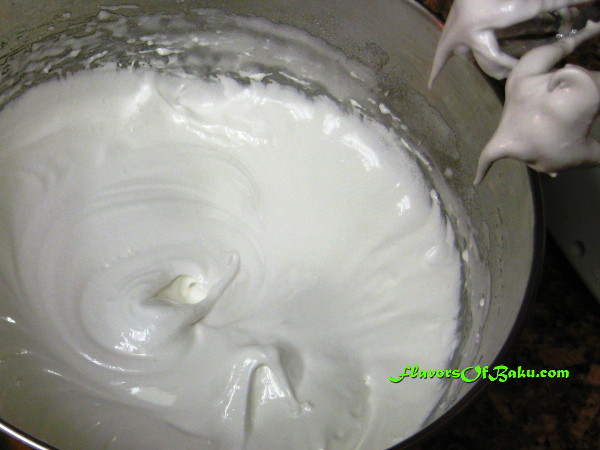 Beat egg whites in a bowl with an electric mixer, then add sugar and continue beating until the mixture holds stiff peaks. Afterward, beat the lemon juice into the frosting. Frost the top of the kulich with sprinkles.